Outside my window….it’s wet and warm. 6C (about 43F) which is wacky in this big Canadian city. The local liquor store has blue and white banners reading “Winter Romance” outside, which look silly considering the grime, water, and greyness of the neighborhood. I am thinking…about the recent airlift by Air Canada employees of supplies into, and children out of Haiti. Read more from my favorite priest/writer Raymond De Souza. I am thankful for… lunch out with all three of my men yesterday. It was great having Alex home from Queen’s this weekend. I am learning… to let go of my stuff. This decluttering process can be painful, but ultimately brings peace. From the kitchen…I haven’t got a clue right now. But I still have frozen black bananas to be used up so I”m likely going to bake this afternoon. There are also some apples ready to be milled for applesauce. I am wearing...v-neck striped tee, black (really grey at this point) jeans, black socks. I am going…to my second meeting of the Toronto Branch of the Ontario Genealogical Society tonight. I am hoping… that Alex is ready to turn off the distractions and get down to work. I am hearing…far too much about Brangelina. I mean, really…who cares??? Around the house…I”m full steam ahead on decluttering our living room, and am almost finished the bookcases. Next up is a TV armoire that we want to sell, but I have to empty it of all the linens, candles, knitting supplies, and other stuff first. One of my favorite things...is my iPhone. Seriously, I know it’s pathetic, but how much can a person be in love with an electronic device? A few plans for the rest of the week: OGS meeting tonight, optometrist appt tomorrow morning, Wilson to the groomers, and then an interesting-looking debate on the nature of time tomorrow at 7pm (we’re all going). Thursday is my cut and colour where I broach the subject of growing out my grey via creative use of highlights and lowlight with my stylist, and then Saturday night is (I think) a birthday party for my brother. Note to self: get a gift. Here is picture for thought I am sharing… Would you not love some retro-atomic kitty cats on tea towels gracing your kitchen? 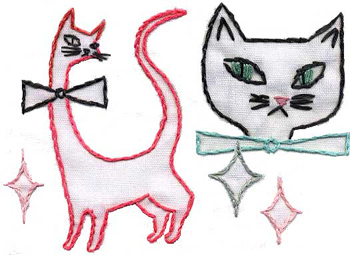 Pattern from Sublime Stitching’s Cat-a-Rama collection. 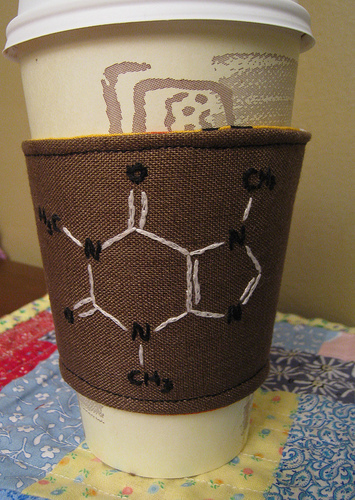 Or what about this cute java-jacket from Coyote Craft featuring a caffeine molecule?